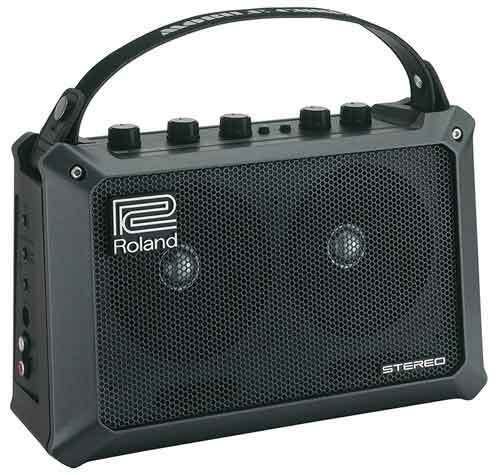 Mobile Cube, Portable Guitar Amp from Roland in the Cube series. Roland introduces the battery-powered Mobile Cube combo. At only 280 mm (W) x 108 mm (D) x 177 mm (H) /11-1/16" (W) x 4-1/4" (D) x 7" (H), no larger than a briefcase, Roland says that their new Mobile Cube is a traveller's dream. Battery-powered, it can be operated anywhere for up to 15 hours. They tell us that two high-performance speakers provide stereo sound that defies the combo’s physical size. Equipped with a Roland FX engine, Mobile Cube offers stereo reverb and chorus effects and a Center Cancel function is also provided for minimizing vocals in pre-recorded music if you are up for a bit of karaoke or play-along performance. Thanks to its variety of inputs, Mobile Cube accommodates microphones, keyboards, acoustic guitars, electric guitars, MP3 players, and more. 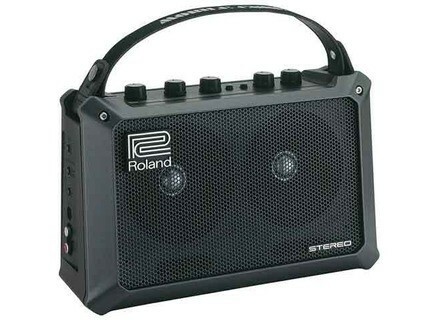 Roland claim that no other instrument amplifier of this size has a stereo input port. They say you can use it as a practice amp at home, while travelling, indoors or out and that it's great for parties, karaoke, and vocal lessons. It’s also possible to onnect it to a mic stand for use as a monitor speaker or micro PA.
[Musikmesse] Boss SL-20 Boss has unveiled the SL-20 Slicer which they have said lets you instantly transform a guitar, bass, keyboard, or vocal into a pulsating groove instrument. [Musikmesse] Bogner Alchemist Bogner announces the Alchemist, a new series of amps inspired by the classic and characteristic Californian amp sounds. [Musikmesse] TC Electronic Nova System TC Electronic announces the immediate release of Nova System, a new floor-based, all-in-one guitar solution combining the quality of analog distortion and overdrive sounds with the convenience of digital controls.